Evaporative cooling, also known as adiabatic cooling, is an effective means of cooling, where the air is cooled as the result of the evaporation of water. 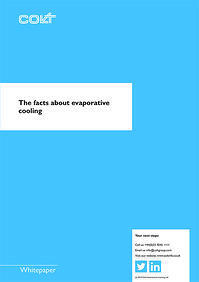 The energy required for the evaporation is taken out of the air and so the air cools down. We see this phenomenon frequently in nature, and it is also easy to find examples of how man has exploited the principle since ancient times. Because evaporative cooling is very energy efficient, uses no refrigerant and also enables a comfortable working environment, this technique has again come into in the spotlight in recent years. Please fill in the form below and we will e-mail you the whitepaper.